It’s the first Saturday morning in August. Everything is cooked and curried. Your band is scheduled to leave at 10, so you hustle to get down to the route for 11. You spend a half hour to find your band. Then another hour getting your body makeup and costume just right. The whole time, the DJ’s been playing tunes on the truck. So you’ve been wining and enjoying yourself. Your best friend is playing in the same band, but in another section, but you all lime together until it’s time for the road. Around 2 pm the MC gets serious and announces the magic phrase, “get in yuh section”. Now the DJ ramps up the tunes to get your blood flowing. As you cross the stage, the DJ is playing the tune that will surely be the most popular of the day, the one that will be crowned the Road March. You and your whole crew are in the zone. But hold up. Stop the record, pump the breaks. There’s a problem here. Carnival in Toronto needs some fine tuning. 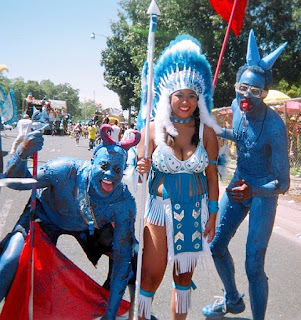 First and foremost, carnival is a festival. A two week celebration. Most people forget that. What happens on that Saturday is not a parade. So let's stop calling it that. So many of the issues and complaints would instantly clear up once we get that terminology correct. The Santa Claus Parade, Labour Day Parade, Easter Bunny Parade and Pride Parade — now they really are parades. Good for them. What we do: we hold a street festival, we play mas, we free up, and fête, and hold a carnival. Call it what you will, but a parade is very much the wrong word. It implies spectators getting a seat, and watching while the scripted show plays out in front of them. Order is vital. Santa must come last, so that everyone knows to go home after he comes on. A parade, in the way it's understood here in Toronto, is all about the spectators. Carnival however, is ALL about the participants. The people playing mas, playing pan, or just chipping down the road -- those are the people having all the fun. The mere fact that spectators can manage to gleam some measure of enjoyment from merely watching us -- well that's just a coincidence. Really it is. The day is designed for the revellers. 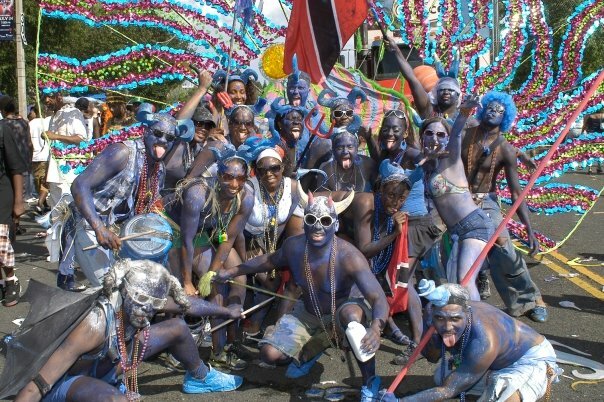 The very first time you put on a costume, and come down the road playing mas, you’ll ask yourself why in the world you waited so long. Now, back to the fête. As soon as your section pass the judges, down go the standards into a huge pile that seems like a bonfire in waiting. Some of those fancy wings from the ladies on the front line disappear as people get ready to really free up on the road. For the next few hours your band slowly inches its way down Lakeshore. You like it when the truck drivers act like they getting paid by the hour. The truck is moving slowly enough for people to jump on and off occasionally, despite the endlessly repeated threats from the MC. You have enough time to walk over and push a five dollar bill through the fence for a little boy to run and buy you some doubles. The food truck in the back of the band is nice, but you can only eat so much pélau in a day. The music shuts off as the truck rolls up to the sour-faced looking police insisting it’s the end of the road. You find the rest of the crew, and try to figure out if you should try and walk back up to catch the band behind you. It’s after 5, and the sun in starting to cool. A nice breeze is blowing in off the lake. You finally obey your tired legs and sit by the side of the road. You’ve been jumping and moving your waist for the last 6 hours. The music’s been sweet. Good food. Nice drinks. And your mas crew, both new and old-timers, are the best. Better than this you want? Now let us compare that day to what it’s like for someone who’s driven up from Ohio to sit in a soccer chair and watch from behind a fence. I’ll leave that as an exercise for the reader. Have your cake and eat it too with Afropan! I say let’s rent the whole of the Exhibition grounds for the entire weekend. The site is more than capable of holding hundreds of thousands of people. And is designed for ticketed entries. Reduce the cost of entering the festival to just a toonie per adult. Boom. Lots of people. Lots of revenue. Instantly the policing costs of the festival are cut right down. No special (read expensive) road closures will be necessary. And we can fête all night. If they can occasionally let bars on Richmond Street serve ’till 4 am, the Caribana Festival Grounds should certainly get the same treatment. And hey, with all that action, maybe we need a $5 weekend pass. And that my friends, is how we put the fete back in the festival. Great suggestion! I would love to see this plan implemented. Win-win all round!